Scrap Paper Scissors etc. : Little Red Wagon #200 - Pretty Polka Dots. Little Red Wagon #200 - Pretty Polka Dots. Little Red Wagon #198 - Sunshine! Little Red Wagon #197 - Falling to Pieces! Little Red Wagon #196 - Christmas in July! Well I didn't quite make it back here yesterday now did I?! Oh well, only one day late.......getting better at least. Time is still taken up looking after the little guy Charlie........yes he is still sneaking in a few potty breaks in my house! One rug has already made it's way to the 'Magic Carpet in the Sky' as it seems to be his bathroom of choice. Since it's disappearance though, things are improving slightly - I see the light at the end of the tunnel........just have to 'train' my girls to pay attention to him rather than the Disney Channel when it's their watch. .........but a slight improvement on last week so who knows, I may even post on time next week! Jan issued our challenge this week and she'd like to see some Polka Dots......large, small, a lot or a little.......doesn't really matter as long as there are some in there somewhere. I decided to go with a Gift Tag, before realizing my offering of Polka Dots was a little poor to say the least. So I added a flower, and then decided there were even fewer Polka Dots on display! 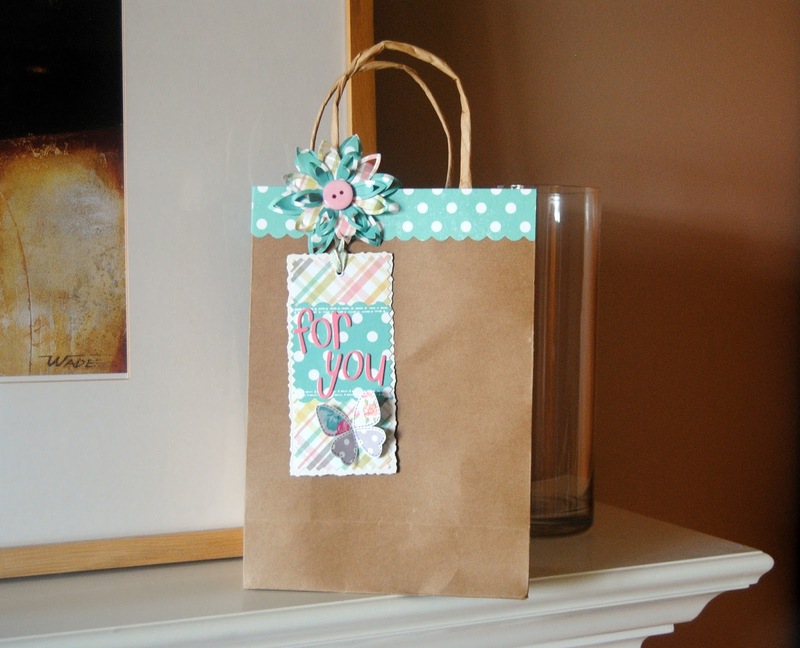 Sooooooo I finally concluded with a Gift Bag and made darn sure there were some Polka Dots on there! Here we go with my Gift Baggy/Taggy kinda thing! Sorry for the glare in the photo, but you may notice that other than the bag, this is purely made up from the scraps left over from the layout I posted earlier this week. Nice when that happens.........the 'hoarder' in me can chill knowing I'm no longer compelled to keep those few pieces of patterned paper I may desperately need at some point in the future - a nice clean break! Here's a close up of those Polka Dots, just in case you're struggling to see them. Well I'm off to check out what the rest of the Girlfriends have been up to..........please join us for this weeks challenge over on the blog if you get a chance. 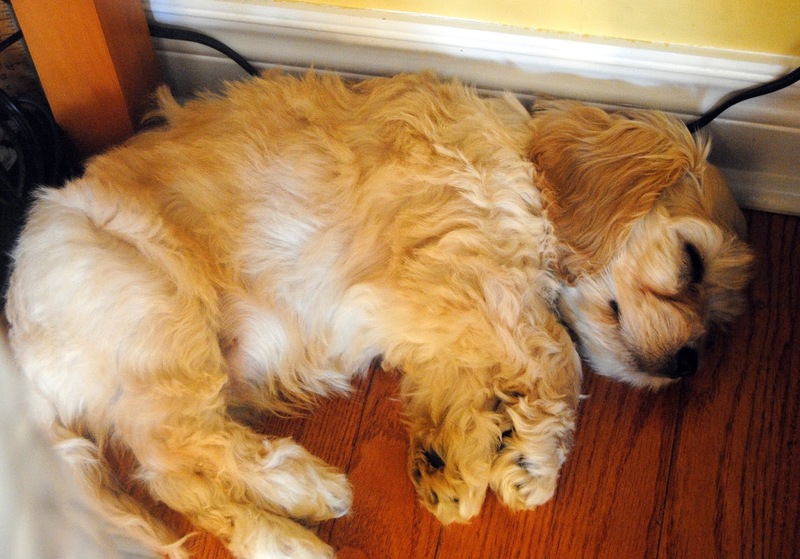 Before I go, I can't leave without another cute piccie of Charlie of course. I'm sensing a little routine here..........every time I bring myself to the PC, he follows and curls up to fall asleep at my feet under the desk. Go on, you know you can't resist - everyone say Aaaaawwww! 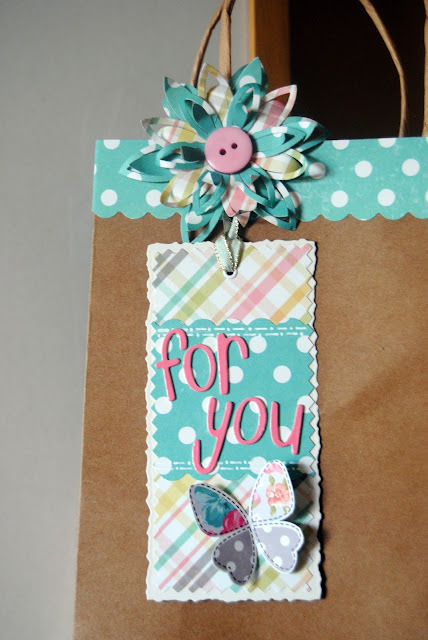 Great way to use up scraps! Wonderful gift bag combo! Love your gift bag Jayne!! What a sweet gift bag and tag! And yes the polka dots are prominent enough...very cute! What can I say about Charlie...he is adorable too! Great gift bag and tag! Love the flower bow too! And the puppy? . . . oh-so-adorable!! !